Unique billet aluminum LED turnsignals that fire front and back to increase visibility. By using 8 high power wide angle LED on each side of the circuit board the indicator is visible from both the front and back at the same time with equal luminosity. This has a substantial improvement on the visibility of the indicators which adds highly to the safety of the motorbike and rider. LEDs offer a much longer life than ordinary filament indicator bulbs. 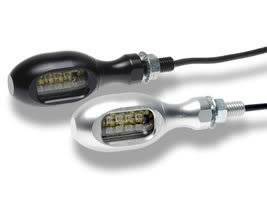 Often LEDs last longer than the motorbike in which they are fitted. With the small current draw of LEDs battery life is improved. LEDs do not have a time delay on operation so they are instantly on at full power. 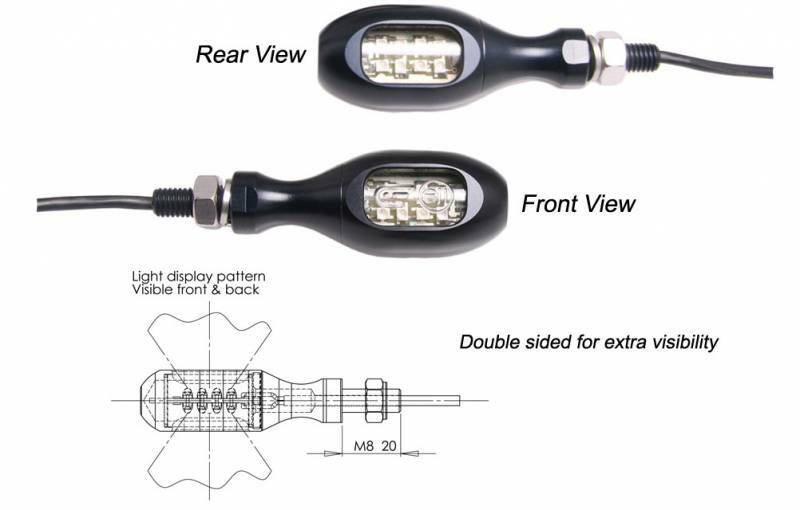 One of the commonest complaints of mini motorbike indicators is the quality of the lenses. Our unique lens envelopes the LED circuit board completely by 360 degrees providing a melt proof, shake proof and loss proof cover. These mini indicators are CNC machined from billet aluminum and are available in black or silver anodized. Complete with stainless steel fasteners, sleeved cable and a M8 threaded fitting to allow front or rear universal fitting to the motorbike. Indicator body size: 68mm long x 27.5mm dia x 20mm width. 15mm spanner flats to aide tightening when fitting to your motorbike In summary, these E Marked 12v LED amber motorbike indicators are the finest quality and offer additional safety for any motorbike and rider.